It just isn't every day you can follow a historic trail that tens of thousands of emigrants walked and rode and drove over 150 years ago, much less a trail in such a scenic area, in such good weather with such good footing. It was another fantastic riding day in and around City of Rocks National Reserve - a 19 mile loop, up a Canyon on a soft 2-track road, skirting Smoky Mountain (at the base of which is our probable ride camp for Steph's probable new multi-day endurance ride), intersecting the California Emigrant Trail (and the main road through the CORNR), to the Twin Sisters landmark. 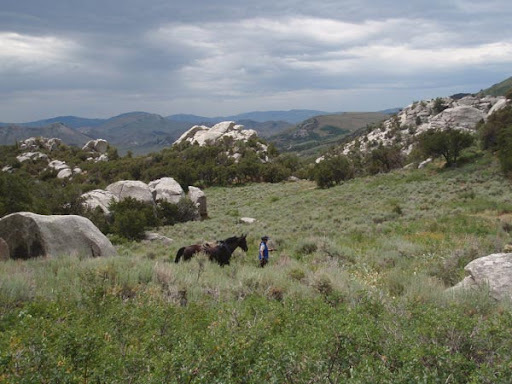 On down the road, riding on and paralleling the California Trail, we turned back down the Emigrant Canyon through which runs the old Salt Lake Alternate Emigrant Trail, and the old Boise-Kelton Stage Route. This Salt Lake Alternate route was opened to wagon traffic in 1848. In 1869 the Boise-Kelton stage and freight traffic began using this route. Half a mile down the canyon, you can see remnants of the old City of Rocks stage station. 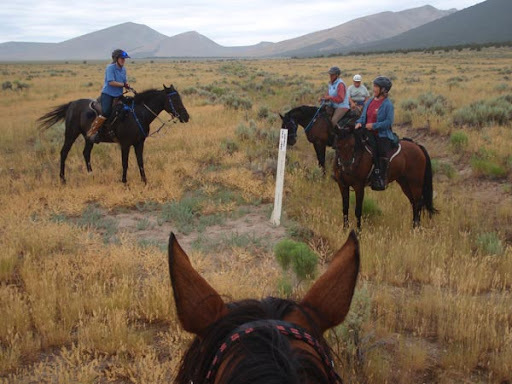 Stage stations were ideally located 10 to 15 miles apart on the emigrant trails, with water and grass for the horses. Our horses partook of both here. A smorgasbord of grass flanked our entire loop - Jose couldn't decide what he liked best, the rice grass, rye grass or crested wheat grass - and he could stuff his mouth full of all 3 in one bite in some places. Footing was fantastic. We rolled at a good clip along most of the loop. 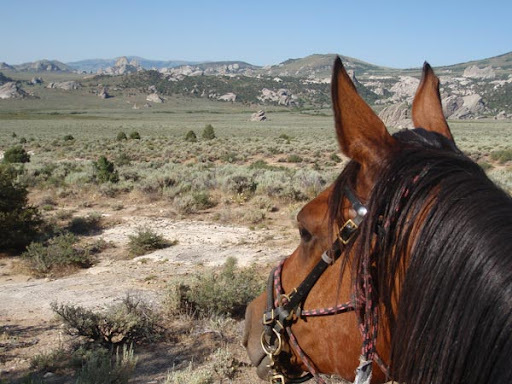 When you're flying along one of these old trails, making time, you just can't help but think about those slow rolling wagon trains full of people laboring westward, heading to an unknown future and destination, other than "California" or "the West." 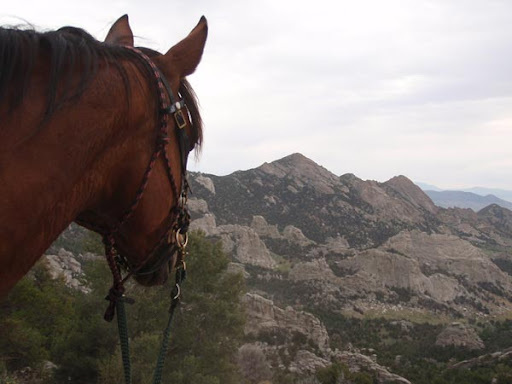 Jose enjoys the scenery as much as I do - while the other horses go on, he stops to look at things, and study and absorb what he's seeing. He's such a soulful horse, I sometimes wonder if he doesn't see into the past, things that happened at the historic places we pass. It's one of the main driving forces behind the flood of a quarter million emigrants that travelled overland to the West in the mid 1800's. 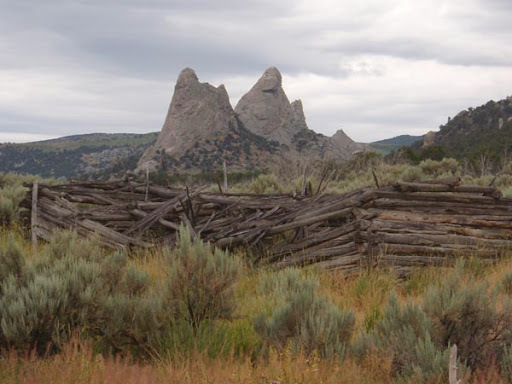 Many of them found their way along the California Trail and laid eyes on the City of Rocks in what is now southern Idaho, at the southern end of the Albion Mountains. 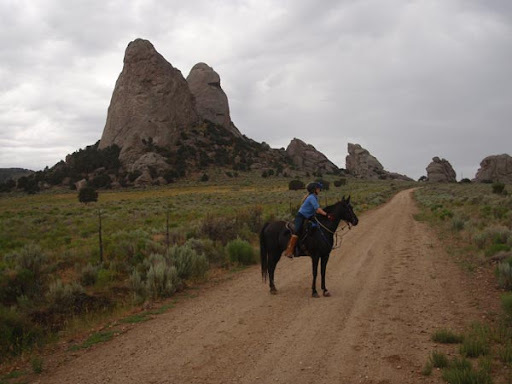 It's Endurance Ride Fever that brings some people to places like this - the desire to ride well, and ride far, to explore beyond the boundaries; the hankering to show off and share beautiful country, the taste of dust, and the flavor of how it was in the old days for the pioneers. 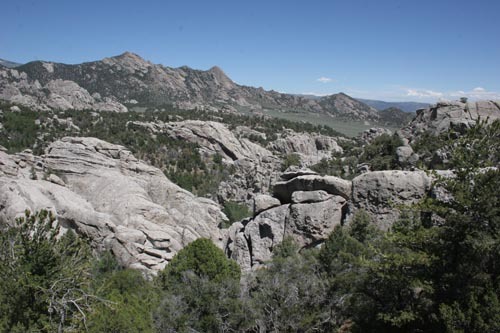 We got a taste of the City of Rocks National Reserve today, riding a 10-mile loop around the valley of the City of Rocks, riding below soaring granite spires where turkey vultures soared on the updrafts. 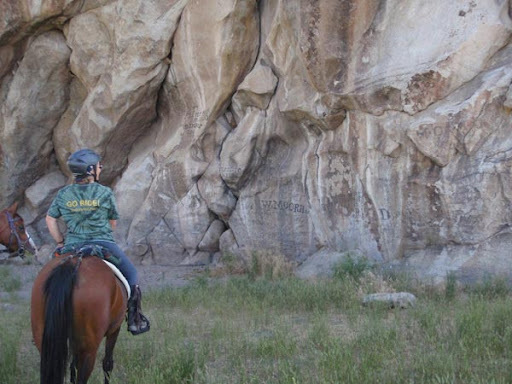 We trotted along a part of the California Trail, riding around Register Rock, where many emigrants wrote their names in axle grease, which you can still see today. What we saw was the tip of the iceberg. What we saw only whetted our appetite. We've got Endurance Ride Fever, bad. We'd sort of gotten the directions to Vet Check 3... but we crossed a creek we weren't supposed to cross, and as the old logging road got windier and narrower as it went up and up, we thought this couldn't be right. "Look for the porta-potty, at the 50's vet check" we'd been told... but - way up here? We crossed the Big Horn trail markers a couple of times, but that could have meant we were on the right road, or totally the wrong road. We were just about to turn around and go back down... somewhere, to find someone to ask (no cell phone coverage anywhere), when we happened upon a portapotty and the 50's vet check, where people still happened to be waiting. "Keep going!" they waved us on. "It's just a couple miles. Pass the Snowshoe Lodge, pass over a cattle guard, you'll see flags turning you off to the right." Hooray, we find all this, and then... nothing. We come to a gate with an unlocked lock on it and a sign that says "Private Property." Another crew guy is there in his pickup. "Do we go through this?" Heck, we didn't know. We both drove through and closed the gate behind us. The road deteriorated - thank goodness it wasn't wet or we might be stuck up here a couple of weeks - and we came to ANOTHER gate. This couldn't be right, we thought, and how much worse was the road going to get? Just about when we were going to turn around and backtrack, we came around a corner to a beautiful mountain meadow busting with flowers and a meandering creek - and a portapotty, and Bill, Bev's crew husband and another truck or two. Yay, we'd found the vet check! 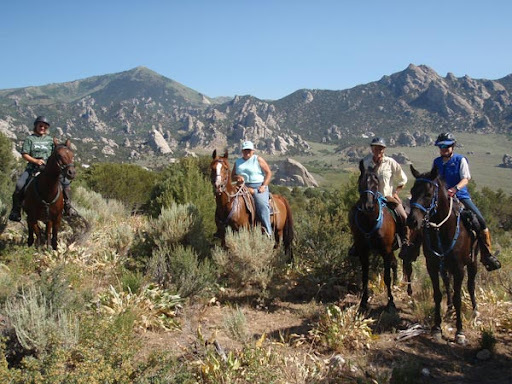 Some lucky humans also had a mountain hideaway tucked there at the end of the meadow (later they came over to visit, and much later they would assist some lost and tired riders and horses). Then came... the waiting. The waiting is the hardest part. The boys had left Vet Check 2 at around 12:30; notwithstanding the "21" miles this section between vet checks 2 and 3 was supposed to be, we knew it would be much more (Tim French later confirmed it was 31 or 32, and our boys GPS'd it at 34 miles), and we were hoping to see them around 8:30 PM or so. We hoped. What to do for hours and hours? It only took so long to unpack the truck with the human and horse food and gear. I worked on my computer a bit, I tried reading, and I dozed off in a chair. Then: I ate, Oh, my God, did I eat. Joe Haeberle's parents, Yvette and John, took it upon themselves to cook food in Dutch ovens for everybody, right there at the vet check. I've had some good food and treats at endurance rides, but this was the ultimate. Fresh-out-of-the-oven wicked chicken fajitas (salad, and dressing on the side, too). If that was not most satisfying, they topped it off with killer peach cobbler topped with whipped cream. I thought I'd died and gone to heaven. I ate so much I got close to nirvana. They made another oven-full of peach cobbler but I had to stay away, though they tried to tempt me again. Then to top that off, I made some coffee with my camp stove and French press, with the extra coffee grounds that Tim French had leftover (ground fresh!) from this morning. Steph and I had our fresh, strong coffee, and lounged around waiting. I was really getting the hang of this crewing thing. Bad Tevis memories were fading. This crewing gig was not such a bad thing. Since we still had hours more to wait, and I was in the serious Over-Done-It-Food stage, I went for a hike up the trail, a little stroll in the Big Horn mountains. Along the old logging road, I surprised and met a deer and a grouse among the lodgepole pines, and wondered about cougars and bears, as I always do. There were moose in this mountain range too - Steph and I would see one of these magical beasts as we were driving out in the dark. I trudged up an incline (difficult after a satiating meal!) 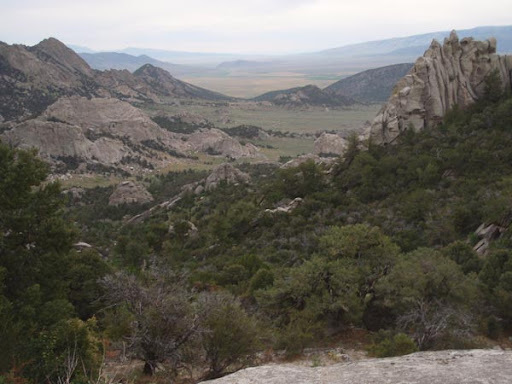 and came out to a terrific view of the next valley, and thought of how it goes on and on - the Big Horn mountain range runs about 200 miles on a northwest/southeast line. It's something Kevin will mention at this vet check - "You go over one ridge, and the view is beautiful. You go over the next ridge, and the view is even more beautiful - after beautiful, after beautiful..."
I kept thinking I'll see the leaders Bev Gray and Kerry Greear in the distance in the valley, but I didn't. I turned around to hike back to camp where people were still waiting. It was around 7:30 PM when someone said "There they are!" 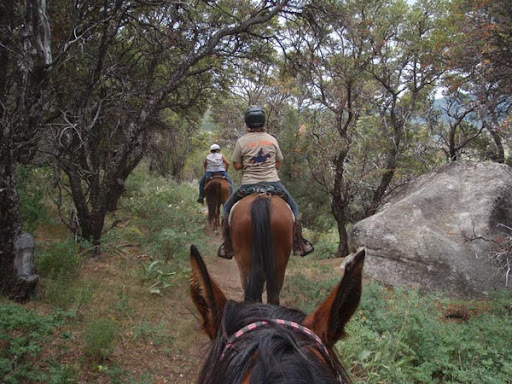 A glimpse of something moving in the trees - a closer look proved it to be a gray horse and a pinto - and the yeehawing confirmed that the first two riders were coming into the vet check. We all echoed their hoots and hollers as they trotted down the road and came into view, then stopped to let their very thirsty horses drink out of the creek. Bev's horse looked great, as did Kerry's. 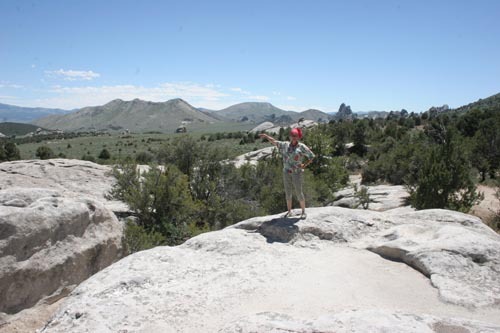 Bev said the trail had been marked great. At the same time, we heard that all the 50 milers were off trail and overtime (the same trail the 100's were riding in reverse). The hold was half an hour, and the sun was just sinking behind the hill as Bev and Kerry trotted out onto the trail for their last piece of trail ("25 miles" or so), and the next bunch came in - Andy and Brandon Bown, Bill Brown (it was Bill and his horse's first 100), and another guy whose name I didn't know. Brandon was looking pretty wiped out. Somebody get that boy a bottle of water! I made another French pressed pot of coffee that was waiting for Kevin, Kevin and Rusty when they arrived at the vet check, right around 8:30 PM. "That section was long! And hard!" But, they'd expected it. I grabbed their GPS's and plugged them into the truck to charge for half an hour. 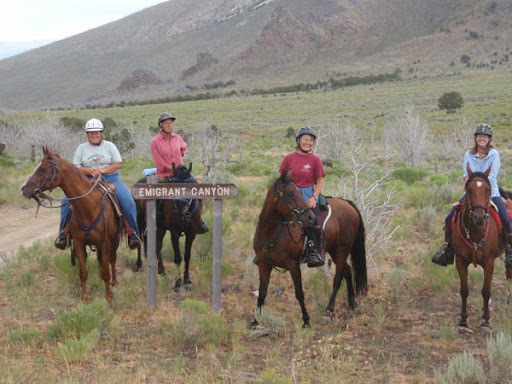 The horses still looked good after around 73 miles (by GPS), and they ate and ate and ate. The horses already had glowsticks on the breast collars, which were broken so they'd light up. The boys duct taped headlamps to their helmets, and reloaded on water and ibuprofen. Kevin M's ankle was stiffening up a bit - he and Far had taken a tumble a week before the Big Horn. Far was fine, but Kevin had bruised his hip and sprained his ankle, and it was making some noise now. With the sinking of the sun, it cooled down quickly with the brisk breeze; it was hard to decide what to wear for the two dozen miles of trail, which would probably take 5-6 hours. It would be hot down on the valley floor, but in the wilderness, you really don't want to be stuck without extra clothing. The half hour blew by quickly and soon the boys were mounted up and headed out of the vet check. "See you at Trapper Creek," we said - a meeting place down on the valley floor about 7 miles (or thereabouts, nobody was sure) from camp. 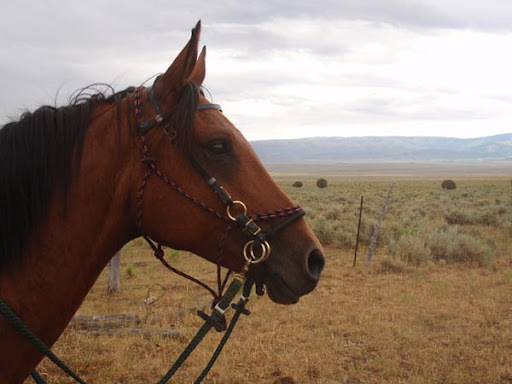 It was totally voluntary, but coming out of the mountains (we heard from last year's veterans), the horses are in need of water and grateful for hay, and humans are grateful beyond words for water or other pick-me-ups for the last miles into camp. The moon would be up soon, so they'd have some of Mother Nature's light to help them along their way. Steph and I packed up the pickup and headed out. Five riders - the Stalleys and Lisa Schneider - were still out, but they should have been coming in soon, as they had been less than an hour behind our boys coming into the last vet check. One rider had been pulled here... in the fading light we wondered how long she'd be out here waiting for a ride for her horse. It didn't appear easy to get a trailer in here, and there wasn't one on the way (we never did see one, on our 90 minute drive back to camp). On the way out, we saw a moose!!!! We weren't sure where to stop ("near the river" but we couldn't see the river). We spotted a parked pickup, and at first we weren't sure it wasn't some local Shell teenagers' make-out spot, until the Haeberle's rolled down their window and said we were at the right spot. Steph stayed in the truck to rest her eyes (and consequently passed out for a while) and I pulled up a chair and yakked with the Haeberles. We talked of tall Big Horn tales, mainly of Joe's experience in last year's fiasco what with the storm, unmarked trail, people getting sick or disoriented and Joe's being passed off to different sponsors as he came down off the mountain. And he wanted to do it again! So far, he was having a good ride, and when he got down to this impromptu stop, while his horse guzzled water, Jose was busy taking photos of the moonlit bluff soaring over our heads. Teresa from Tennessee also joined us - she had come all this way to crew for her friend Roxy Welling and the Colombians. One of the boys was pulled at vet check 2, but the other boy and girl were still riding with Roxy. Teresa had had a hard time finding vet check 3 in her truck because she hadn't had anyone to follow and didn't have a map (because one didn't exist) and the road to the vet check just wasn't marked. You had to know who to ask (or just get lucky), and when, to get where you needed to go. The one thing Steph and I were did not have in the otherwise full truck was horse water; fortunately the Haeberles left us plenty of buckets full of water, and Theresa had some extra water too. The Haeberles left after Joe, and Teresa and I sat out in the pleasant moonlit night, watching and waiting for horses and riders to come off the mountain, talking a bit, spacing out a bit, trying not to fall asleep. We saw some lights coming... but it was somebody in a car, stopping to set out those flashers marking the trail for the riders - either this hadn't gotten marked yet, or the markers had been pulled and somebody was re-marking the trail, or they were adding to whatever markings that were there. 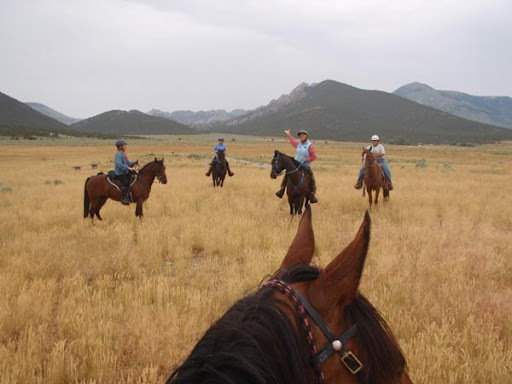 We called over any riders or horses that were passing near; every horse guzzled water and ate some hay we'd thrown out. Everybody spent a few to ten minutes here letting their horses eat and rest. Steph came out of the truck in a short-nap-too-little-sleep torpor, just as our boys came down off the mountain around 12:30 AM, and we called them over for refreshments. They said that part of the trail was LONG and SLOW, and everybody looked tired - but still good. It was about 7 miles or so in from here; 90 minutes or so by trail into camp. All I could think about was falling into my bed; I was pretty whooped. All I did today was eat, drink, wait, and wait some more (on little sleep the past 2 nights) and all I wanted to do now was balance that all out with sleep. I tried to tell myself that I wasn't riding, so I couldn't possibly be as tired as our riders, or their horses, but it wasn't working. I was a wimp. Back at base camp we let the dogs out of the trailer for a run and a break, set up the horses with hay, grain, and water, and corralled the dogs back in the trailer - and I am almost ashamed (but not really) to admit I could not make myself stay up for the boys' finish, which came about an hour later at 2:30 AM. We figured they'd finish, they had to finish after that grand effort. So we'd see them in the morning when the sun was up. Overall, I thought I'd redeemed myself crewing (except for the forgotten Starbucks vet check, which Tim French saved with his fresh coffee makings at that vet check, then giving us grounds for the last vet check), it was a perfect day in some spectacular mountains, our horses did great and we had fun. I was glad I didn't ride... and I had a great time. I passed out in my bed before my head hit my fluffy pillow. The full moon hangs over the soaring walls and cliffs of the Big Horn mountains, as we drive to the first vet check at 5 AM. Up and up and up, driving around and around in hairpin curves, we climb to Granite Pass at 9000'. The morning sun is just starting to crest the horizon when we turn off the highway and climb up and up some more. When we get to a snow field, the lead crew truck pulls a "Road Closed" sign out of the way, and we try driving further on, toward where last year's vet check was; finally the lead truck turns around and decides we should have the vet check below the snowfield, so nobody gets stuck or slides off the road. Good plan I say! The vets didn't object to the location when they arrived. As the water is starting to warm up, I realize I forgot the coffee grounds. I am crushed. I start having flashbacks to my Tevis crewing fiasco. ("Where's my Starbucks!? You didn't bring the Starbucks?!") Sadly, I dismantle the stove and pack it and the French press away. I climb up the steep hill to where I have a view of the trail where the riders will be coming from; indeed a panoramic view of the Big Horns. It's pretty stunning, pretty fantastic to be waiting for our riding friends who are crossing this immense country on horseback. The biggest part of crewing is: waiting. You wait, and wait, and wonder, and sometimes worry. I tried calculating when they would arrive... supposedly this first section was 28 miles, so, at 6 mph, climbing most of the way, it should take around 5 hours, so somebody should be appearing around 9 AM. And sure enough in the distance, little moving dots became apparent. Across a broad high valley flanked by snowfields, the first 4 riders came my way. Andy Bown is off jogging while tailing his horse. The first riders drop down off the ridge into the vet check. Our boys are all smiles when they come in not long after the leaders, and the horses look good so far. Since I've forgotten the coffee grounds and can't provide coffee, my next most important job is remembering to remind the boys to plug in their GPS's during the vet check. A fully charged battery will only last around 11-12 hours, so it's vital to do this during the two 1-hour holds. As it is, the batteries might still run out near the end of the ride - in the dark - when you least want them to! GPS's have been absolutely essential in the last couple of years of this ride, in getting lost riders down off the mountain after getting lost in the dark, or having no marked trail to follow. The boys rest while the horses chow down. They eat the whole hour. In fact the boys, and us girls, eat well too, because Tim French has taken it upon himself to cook eggs and bacon for everybody at the vet check, along with coffee, made from fresh grounds!, out of the back of his truck! What a big unexpected treat that was! It tasted extra delicious being out in the boonies. Everybody leaves out of this vet check; it's only (we are told) about 11 miles (!) to the next one. Laura's horse looks off, and Bill's might have something going on, but the vets let them go on since it's only about 11 miles to the next vet stop, where there's easy access for trailers. Kevin and Rusty and Kevin head out, all looking good so far! "You can't miss vet check 2," we're told, "it's right off the highway. You passed it coming in this morning." I didn't notice it because I was too sleepy (probably not the best state for crew to be in), but Steph saw it, and we easily get to the next vet check in short order. It's at Antelope Butte ski area, a small affair but with cabins tucked in the woods, and a green meadow busting out in spring flowers at the moment. This is where last year's rainstorm began that wreaked havoc for so many people in the ride, but this year the weather is perfectly clear, and still pleasantly cool up here at altitude. We set up the horse and rider gear and food - Steph cuts the carrots up in little bites for our horses. Bev Gray on Jolly Sickle, and Kerry Greear on Joe have taken over the lead coming into this stop. This is Jolly Sickle's second season and his second hundred. It's Bev's 50th (!) 100-mile ride. It's her 5th Big Horn - she finished 4 times, winning and getting BC on Paladin in 2001. It's Kerry's 3rd Big Horn 100 ride. Our boys were a little late coming in to this check, having been passed by a handful of people. Oh no, we thought, did they get lost? Sure enough, after arriving, they said they'd lost the ribbons for a while. "Same place as last year!" Rusty said. But they knew where they were supposed to be going, and they had their charged GPS's on, so they were able to find the trail again, and continue on. The horses ate their fill, switching between grain, hay, grass, alfalfa, and carrots. Far's favorites were the dandelions. He rested more than the others, and he might have looked tired, but he was probably just conserving his strength because he knew how far he had to go yet (he finished last year with Kevin, as did Rusty and Rocky; it was Kevin W's and DE Golden Ali's first Big Horn 100). Besides, his CRI was 56-52, so he was doing well. Bev and Jolly Sickle led the way out of Vet check 2, headed to Vet check 3, somewhere in the mountains at Battle creek. We'd heard the mileage was "21" to vet check 3... but Steph had been told the same thing in 2006, and it had taken her 7 hours - no way it was only 21 miles. We expected the same inconsistency this year. This was also the part of the trail where 'some trail had been taken away, some had been added'... but nobody really knew how, where, or how far, since it had not been communicated to riders and crews by ride management at last night's meeting. We were prepared... but other riders were not. This big discrepancy would later affect some of the riders on the 100. We sent our boys on their way after an hour hold, wishing them a safe journey. 39 miles down... ?? ?how many?? to go!